If the stains on your teeth bother you, you are not alone. A study conducted by the American Academy of Cosmetic Dentistry (AACD) looking into what people would want to change about their smile showed that the brightening their teeth is a common wish. Several factors are responsible for tooth stains, each unique and requiring different treatment approaches. In this article, we will address the different causes of tooth discoloration and the suitable dental treatment for removal. Extrinsic stains refer to discolorations of the enamel, the first layer and hard shell protecting other layers of the tooth. The enamel is exposed to all the foods and drinks you consume and with time, it absorbs the color residue of the drinks and foods. From berries and curry to regular beverages like coffee, tea, and red wine, the enamel is constantly at risk of discoloration. Since these stains are on the outer layer, it is possible to remove these stains by using whitening toothpaste. The toothpaste cleans the teeth by gently abrading the teeth with light scrubbing. If whitening toothpaste is not effective, especially on intense stains, you will need to see a dentist for a professional deep cleaning to whiten the teeth. To ensure lasting results after whitening, you need to avoid strong-colored consumables for days after the procedure. Intrinsic stains occur on the interior of the teeth when the dentin (the layer after the enamel) gets stained. The dentin has a natural yellowish or dark color, which becomes visible when the enamel deteriorates due to poor oral health. This type of stain can be a result of excessive use of tetracycline antibiotics during childhood or injuries to the teeth. The stains occur inside the teeth, which means they cannot be removed by regular whitening toothpaste. Instead, you would need professional whitening by a dentist, or use at-home whitening kits to remove such stains. The whitening kits contain active elements for eliminating deep stains and surface stains. Persistent intrinsic stains can also be covered with dental restorations including crowns and bonds. Bonding entails placing a composite resin on the stain before filing it into the proper shape. After polishing and smoothing the resin, you will have the original color of the tooth back. Crowning, on the other hand, involves placing tooth-colored caps on the discolored teeth, to hide the stain. It is normal for changes to occur with aging, and teeth are no exception. With age, the dentin becomes darker, and the enamel wears down. These two changes cause tooth discoloration and is not a result of human factors. For this, the dentist may recommend penetrative treatment — home bleaching kits, in-office whitening procedures and oral bleaches can eliminate these type of stains. Even after the whitening process, the teeth may still look discolored. If you are not satisfied, the dentist may cover your enamel with dental crowns or bonds. Do you have any more questions about how to treat tooth stains? 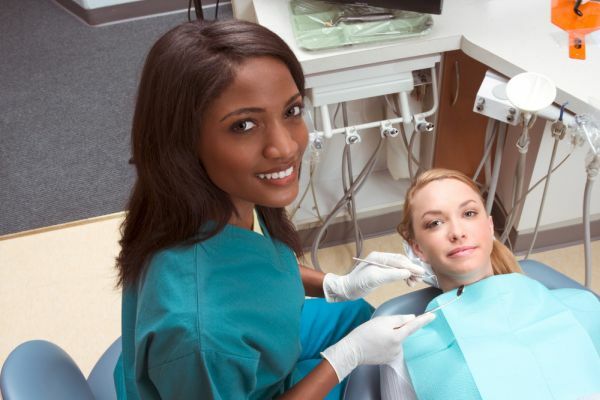 Contact one of our dental health professionals today. Request an appointment here: https://muhlenbergdental.com or call Muhlenberg Dental Associates at (610) 844-9825 for an appointment in our Reading office.